The Catholic Church sees marriage as a vocation, a special calling from God. He created us, He knows us and He has a special plan for us. If you are engaged and planning a wedding, please call the Parish Office at least 12 months in advance of your wedding date. Marriage preparation and Pre Cana classes are required and are a means to deepen your relationship with your partner in regards to marriage. 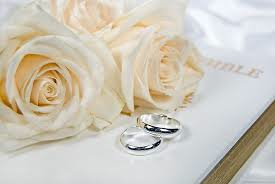 Renewal of Wedding Vows – Many parishioners ask to renew their wedding vows from time to time as a reminder of the importance of the Sacrament of Holy Matrimony, and they realize the significance of a God centered marriage. These celebrations usually take place on an important wedding anniversary such as the 25th, 40th, or 50th, but vows may be renewed at anytime. Remarriage due to death and annulment. New Love, New Life remarriage program was designed specifically for those couples who are remarrying after a death or an annulment and believe strongly in the longevity of marriage as taught by the Catholic Church. They also believe that education, enrichment and support are necessary in order to sustain a life-long, life-giving marriage relationship. Call the Parish Office for an appointment to meet with the Pastor to discuss renewal of wedding vows and/or remarriages.